In retrospect, it would have been better if my wife had let me stay home to see Meet the Press instead of making me schlep across town to watch Jim Wallace die. That’s the compelling and funny voice of 88-year old Baruch Schatz. He’s better known as “Buck” Schatz. And yes, it’s pronounced “buckshots.” Buck does schlep over to visit with Jim on Jim’s deathbed, summoned to hear a final confession from his old Army buddy: Jim took a bar of Nazi gold as payment to look the other way when SS Commandant Heinrich Ziegler escaped in 1944. Jim’s counting on Buck’s hatred.. and his skills as a former Memphis detective… to find Ziegler and his gold. Little does Buck know, but Jim was quite a deathbed chatterbox, and the word spreads, wreaking havoc. Don’t Ever Get Old chronicles Buck’s journey to find the gold with the able assistance of his book-smart grandson, William Tecumseh Schatz. College nickname: Tequila Schatz, of course. The journey is highly entertaining, filled with some appropriately audacious twists and turns, and leavened with the knowledge that Buck’s losing his memory. But he’s plucky about it, and his notebook that’s filled with entries marked “Something I don’t want to forget” is a great way to provide backstory and character insight. Of course, Buck and Tequila are successful, hauling around 200 lbs of gold bars in the dead of night. (Of course, easy come, easy go. They don’t get to keep them.) Don’t Ever Get Old earned a solid 4-star, maybe even 5-star, rating from me. 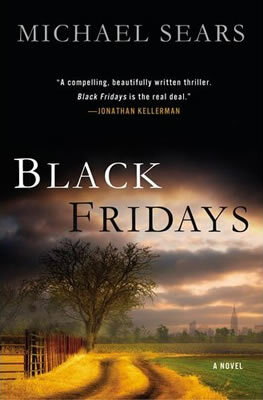 The second book in the line-up is Michael Sears’ Black Fridays, a financial thriller. Equally interesting protagonist: Jason Stafford’s getting out of jail after a two-year stint for financial shenanigans as a Wall Street trader. His plan is to reunite with his ex-wife (divorced only for the purpose of shielding assets) and son and figure out a way to make a living. Flies in the ointment: ex-wife is beautiful, but trashy, and wants to keep the money and jettison Jason. She’s also jettisoned their 5-year-old autistic son, leaving him with her mother while she lives a party lifestyle. Jason’s hired by a company to look into the trades of a recently deceased trader, because something smells fishy. It gets fishier, and Jason soon comes to believe that financial crimes are not the only crimes committed – he’s thinking murder. The pressure mounts as he unravels who did what and why, all the while deciding what to share with the FBI and working hard to keep his kid safe while exploring a new romance. As with Buck’s gold, Jason uncovers a secret stash of casino chips. (He doesn’t get to keep those, either.) It’s a worthy effort and reminiscent of John Grisham. Ranking the two debut novels: Both Sears and Friedman have a deft hand. The plots, though twisty, are easy to follow. I cared about the characters and thought the backstories of both were excellent and well-presented. However: Buck’s character is more fully-realized than Jason’s. Jason is more of a concept – “white collar criminal with autistic son.” Friedman also has the edge when it comes to plot. It’s more compelling and hangs together better. 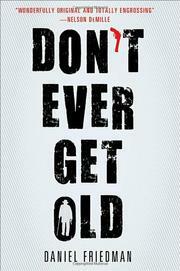 So while I’d recommend reading both, when it comes to giving out Edgars, I have to go with Don’t Ever Get Old. An aside: My manicure lady saw the Friedman book and thought it was nonfiction! Ha! This entry was posted in Commentary, Review and tagged Best First Novel, Daniel Friedman, Don't Ever Get Old, MWA Edgar, ranking, Review. Bookmark the permalink.